I've never carved jack-o-lanterns with the boys. The first year Nathaniel asked about it was last year, and I thought it would be too messy. Plus, I figured I'D be the one cleaning up the mess -- seeing as how history is the best indicator of the future and all. But this year Nathaniel and Nicholas both started asking about carving pumpkins around, oh, JULY, so I figured this year I'd up the ante and really go for that Mom of the Year Award I've been after all these years. 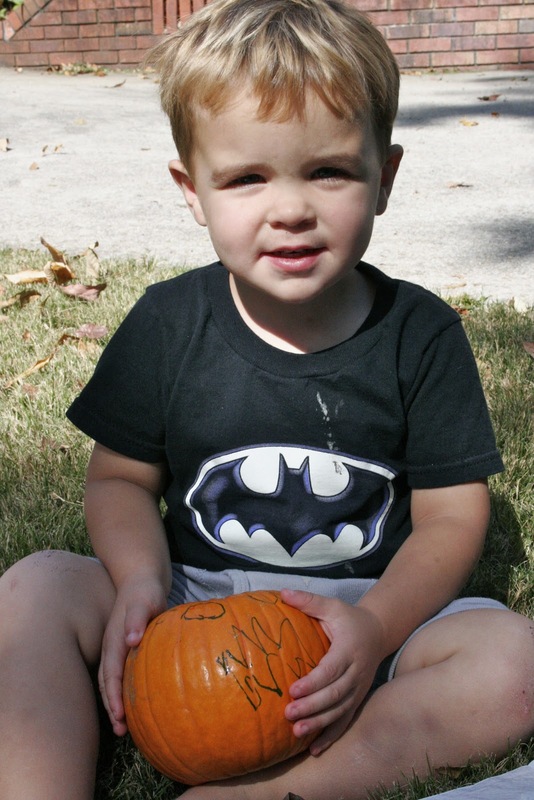 Nicholas wanted an IDENTICAL COPY of the picture he'd colored at the pumpkin patch over the weekend. Jake wasn't picky at all. I was most impressed that he was able to color a face on his ... he's been working on his fine motor drawing skills in Phonics, learning to draw letters. But he drew a great face with a cute, jagged mouth! After I did the carving, I started pulling all the Spring flowers out of my planters. What. It's only almost November, y'all. JUDGEY. I replaced them with some little pumpkins and gourds I'd picked up at Wal-Mart. There's a reason I usually pay our friend Tim to fill my planters. Several reasons, actually. Number one, it's still hot here and I don't like to sweat. Number two, I am TERRIBLE at estimating how much stuff I need to fill all of my planters. And number three, I truly, truly don't enjoy doing it. Do you see what I mean about being terrible at estimating how much stuff I need? I have to go back and get like four more bags of mini-pumpkins to fill in all the gaps. 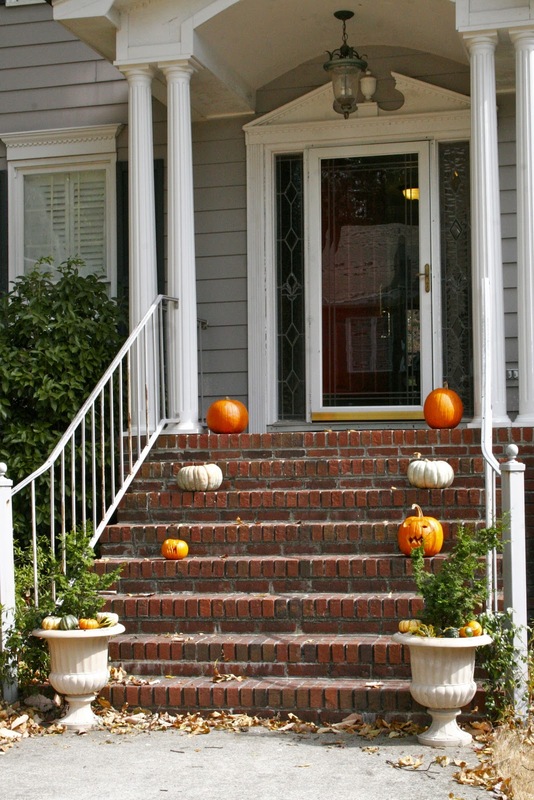 And how come some people can stagger pumpkins on their steps, but when I stagger them it just looks like I didn't buy enough? 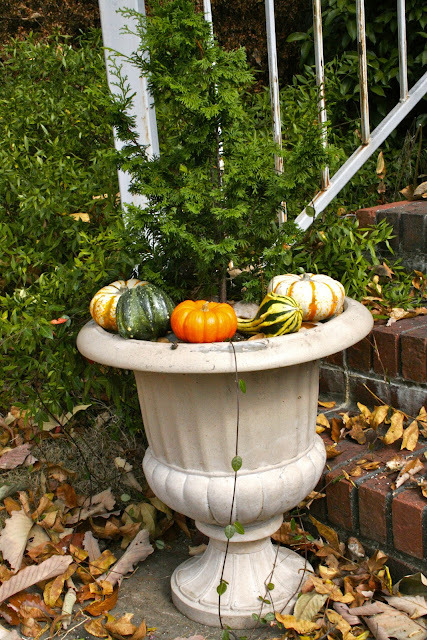 And yet again, in the planters at the bottom of my steps, I need twice as many pumpkins and gourds as I bought. GAH. And also, I could stand to sweep. I do miss having a porch to decorate since we moved and I dearly miss trees. However, in Ohio there was this strange wind vortex that landed ever leaf in the neighborhood in our fenced in back yard. All the other yards would be clean and we'd look like a ball pit for leaves. It would take a couple days to get them all out. Yeah, I don't miss the leaves. It is looking very, very cute though! And the boys' pumpkins look great! I've never let Jameson carve a pumpkin and he's 8. It's just too darn hot in Alabama to have a carved pumpkin....it starts to "wilt" the day after it's carved. Fortunately, he's happy drawing on his! HAHA! I can't ever seem to buy enough things to fill my porch. I buy TONS of stuff, thinking it will be more than enough, and it looks like I have three things up there...haha! 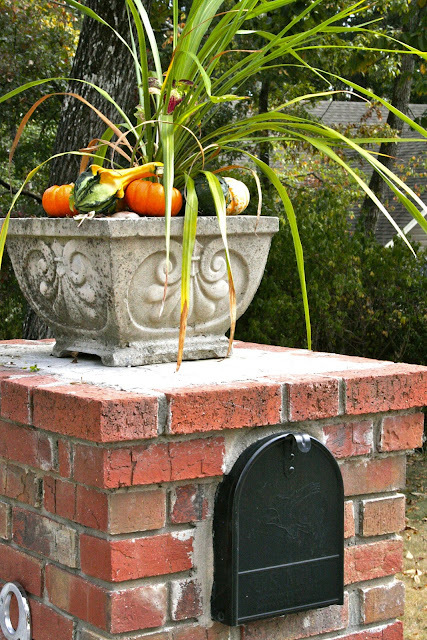 I keep meaning to get more pumpkins and I keep forgetting! That's a bad thing, since it's already written on my Post-it Note and all. GEEZ. I'm worried about the carving because the pumpkins' skins are so tough that you have to use our Cutco knives to cut through them, and those knives can cut straight through bone. I'm worried about the boys' phalanges!